Our experiments have discovered that most raw foods contain friendly, lactic acid producing bacteria, while cooked foods contain none. We found that even raw garlic, which kills worms, parasites and Candida albicans contains friendly flora. One clove of garlic blended in a cup of almond milk yielded one cup of yogurt ten hours later. No yogurt culture was added. We found that one tablespoon of freshly squeezed orange juice could make one cup of yogurt in 12 hours, while only 1/4 tsp. of lemon juice could make a cup of yogurt in eight hours. Bee pollen and lemon juice turned out to have the highest concentration of friendly flora of all foods we tested. Besides bee pollen and lemon juice, other foods that showed the presence of friendly flora were carrot juice, cabbage juice, raw broccoli salads, and extra virgin coconut oil. Based on our research, a quart of yogurt can be made with one teaspoon of freshly squeezed lemon juice blended into rice milk as well. Lemon juice produces a natural lemon-flavored yogurt in about ten hours. No culture or yogurt starter was used in these experiments. The experiments showed that bee pollen, lemon juice, garlic, and broccoli possesses some very unique and wonderful health giving properties - if eaten raw. These foods should have a great health benefit for persons with Candidiasis, cancer, AIDS, or digestive disorders. But even more effective is coconut oil, which works by the presence of lauric acid to kill Candida, present in very case of cancer. The oil works with the liver to detoxify the system and support the thyroid gland. The legendary healing powers claimed for coconut oil, bee pollen and lemon juice can now be (at least) partially credited to this recent discovery that they contain very high concentrations of friendly flora. Do your stools float or sink? For persons with Candidiasis, cancer, AIDS, or leukemia, and who generally have 'sinking stools', lemon juice may turn out to be the best to use. Floating stools are usually an indication of active friendly flora in the colon, as the lacto bacteria produce a kind of fat that causes the stools to float, to be firmly formed and soft. Note: a diet high in hydrogenated fats may produce floating stools that are very hard. It's not a healthy stool, even though it floats. Stools that sink are a sign of the absence of friendly flora from too much cooked food, and is usually indicative of a deteriorating state of health. The diet regimen we recommend is to juice a fresh lemon three times a day in water or salad dressings, along with lots of raw foods, especially cabbage and broccoli. These foods will usually restore friendly flora and floating stools in a few weeks. Because of a recent discovery that lemon juice is one of the most concentrated sources of friendly bacteria found anywhere in nature, the juice of one lemon may be substituted for half-a-cup of cultured cabbage juice or sauerkraut. A good tasting drink to implant friendly flora in the colon, is to juice one lemon and one orange and drink this a half hour before meals three times a day. Your stools should be floating in about one week on this program. The lemon juice and orange juice may be substituted for the cultured cabbage juice. So don't use any canned or bottled commercial lemon juice or orange juice, as the friendly bacteria have been destroyed. There is no substitute for the real thing. 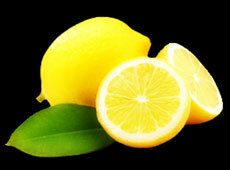 Add the juice of one lemon and one orange to a glass of filtered water. Add one heaping teaspoon of psyllium powder and drink this once a day. To kill Candida throughout the gastrointestinal tract, take five 'Yeast Fighters' capsules by Twin Labs while you are swallowing the mixture of psyllium powder and lemon-orange juice. To kill parasites, take two black walnut capsules along with the drink. To help kill Candida systemically, take two Fennel Thyme capsules also. Thyme kills Candida in the sinuses. This combination is very effective against Candida. To eliminate Candida in the colon, take two enemas with two tablespoons of lemon juice and one clove of raw garlic added to a quart of water in a blender, and blend for 30 seconds. Then, pour into an enema bag and use this solution once a day until all Candida is killed. This can be determined by a return of normal energy. Bee Pollen has a stimulating general tonic that corrects bi-polar disease, hormonal imbalance, and enzyme and B vitamin deficiency. Pollen is created from the male parts of flowering plants and is provided in nature to fertilize the female flowers that produce seeds. Collected on the hairs of bee legs while pollinating the flowers, a bit of bee sweat is mixed into the granules, and drops onto a net under the hive when it enters the small hole of the hive, and then harvested by man. 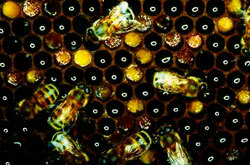 The bees also store their pollen granules upon returning to their hive. It remains stored until used for food and other things in the hive. When taking bee pollen as part of a health program, always start out with small doses (a teaspoon) as some have reported allergy symptoms connected with its use. Bee Pollen is completely balanced for vitamins, minerals, proteins, carbohydrates, fats, enzyme precursors and all essential amino acids. Bee Pollen is often used as an antidote during allergy season. Bee Pollen also relieves other respiratory disorders such as bronchitis, sinusitis, and colds. U.S. Senator Harkin said that taking large doses of bee pollen cured his asthma, which had plagued him most of his life. He also said he had taken everything that modern medical science ever had and none of it worked until he took bee pollen. As with Royal Jelly, bee pollen helps balance the endocrine system, showing especially beneficial results in menstrual and prostate problems. The enzyme support in bee pollen normalizes chronic colitis affecting the colon and stopped the subsequent constipation/diarrhea symptoms of this genetic disorder, which can also appear in other parts of the body. Recent research has shown that bee pollen helps counteract the effects of aging, increases both mental and physical capability, and fortifies the immune system against illnesses.